Distributed object caching is essential for building and de ploying Internet wide services based on middle wares such as CORBA. By caching objects, it is possible to mask much of the latency associated with accessing remote objects, to provide more predictable quality of service to clients, and to improve the scalability of the service. This pa per presents a combined theoretical and practical view on specifying and implementing consistency conditions for such a service. First, a formal definition of a set of basic consistency conditions is given in an abstract, implementation independent manner. It is then shown that common con sistency conditions such as sequential consistency, causal consistency, and PRAM can be formally specified as a combination of these more basic conditions. 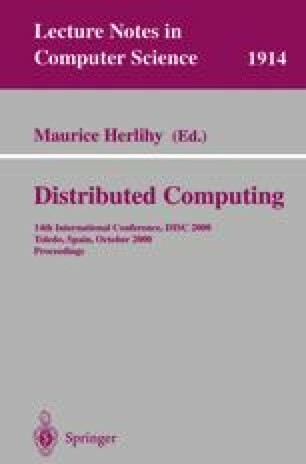 Finally, the paper describes the implementation of the proposed basic consistency conditions in CASCADE, a distributed CORBA object caching service. This work was supported in part by the Israeli Ministry of Science grant number 1230-1-98.